Living on in the hearts and minds of countless generations, the glorious shield of Achilles has inspired endless varieties of creative genius. As TheShieldofAchilles.net is devoted to exploring the rich wealth of human endeavors inspired by Homer’s legacy, this post is inspired by the creative genius of Brooklyn-based writer and director Bryan Doerries. Through the highly acclaimed performances of dramatic readings from Ajax, Sophocles’ ancient Greek tragedy, Doerries’ Theater of War explores the battle scars of warriors, offering audiences katharsis (Latinized to catharsis), a timeless and timely form of emotional healing. Founding Theater of War in 2008 after recognizing the cathartic effect of Greek tragedy on his own emotions, Doerries enlisted performers to read from his own translations of Sophocles’ Ajax and Philoctetes. Sophocles’ Ajax follows up on Homer’s narrative of the competition between Odysseus and Telamonian Aias (Latinized to Ajax) for Achilles’ armor during the funeral games held in Achilles’ honor. Dredging the rock bottom depths of the invisible wounds of war, Sophocles vividly and tragically presents Ajax’s internal emotional conflicts that ultimately drive the hero to commit suicide. In 2008, Brigadier General Loree Sutton was the US military’s highest-ranking mental health professional and she clearly agreed. Hoping to address the alarming rise in suicides among military service members, she enlisted Doerrie’s Theater of War to provide this catalyst to healing in a very big way. US Service Members attending a Theater of War performance in San Diego. A compromise was quickly reached and 400 marines attended the first performance held in 2008 in San Diego. To date, Theater of War has presented over 300 performances of Sophocles’ Ajax and Philoctetes for military and civilian audiences throughout the United States, Europe, and Japan. Over 80,000 service members, veterans, and their families have attended Theater of War performances and participated in follow-up town-hall style discussions, speaking openly and often quite emotionally about combat and homecoming experiences. If Achilles is known and loved as the Bravest of the Greeks, Ajax is surely the Second Best. Ten long years of hand-to-hand combat has splashed the fame of Ajax boldly across the war-torn terrain, rising in the wake of his exploits against the Trojans. But now, spiraling into black depression following the death of Achilles, Ajax finds no release for his raging anguish over losing the prized armor of Achilles in his competition with Odysseus. With the Trojan War wrapping up, all of the Greek warriors are thinking about their glorious homecomings, dreaming of finally reuniting with loved ones. But not Ajax. Instead, he is obsessed with childhood memories of his father’s heroic exploits, his father’s heroic homecomings, his father’s heroic treasures being displayed as triumphant prizes of war. The memory of other war prizes Ajax has already accumulated for his homecoming is totally eclipsed by his anguish over returning home without the glorious war prize of Achilles’ immortal armor. Believing his father will forsake him in the face of such shame, Ajax loses his grip on reality and his sanity starts to slip. Composing his classic tragedy about the extraordinary pain and suffering, or pathos of Ajax in the 5th Century BCE, Sophocles was a twice-elected general in the Athenian military. We may define Sophocles and his fellows as ancient Greeks, but this term implies a temporal remoteness that, under close examination, just doesn’t apply. These are the original composers of democracy, as instituted by means of election, governed by means of law, and defended by means of military force. As citizen soldiers, Sophocles and his contemporaries were very familiar with the tragic suffering that accompanies war. They experienced the same realities that we do, today, of shattered peace and traumatic death and destruction, shared by governing politicians, heroic commanders, long-suffering soldiers, and anxious loved ones alike. Sophocles, Euripides, and Aeschylus wrote their classic tragedies for performance during Athens’ ritualized annual festivals, expanding on the beloved tradition of annual performances of Homer’s Iliad and Odyssey. These new tragedies commonly featured familiar characters from older legends, especially the Trojan War. In his 2015 book, The Theater of War: What Ancient Greek Tragedies Can Teach Us Today, Doerries explains that the tragedies were written in a century that experienced 80 years of war. He also notes that they were composed for massive audiences, sometimes up to 17,000 in one sitting, of citizen soldiers—and even the actors were probably veterans of war. Year after year, generation after generation, the people flocked to the annual drama festivals to experience, once again, the beloved but tragic re-enactments of superhuman pain and suffering by larger-than-life heroes. Why were these terribly tragic and painful dramatic re-enactments so wildly popular in ancient Greece? From Aristotle’s examination, we understand that katharsis is a core principle at play within classic Greek Tragedy. Aristotle recognizes that re-enacting a frightful and sorrowful action from the past brings about catharsis—purifying, or cleansing the emotions of the present audience. So it is precisely in the re-enactment of Ajax’s terrifying and pitiful superhuman pain and suffering, or pathēmata, that we achieve our own emotional cleansing, or katharsis. A huge and intensely personal sense of emotional relief following the performance of Sophocles’ Ajax is clearly contributing to the wild popularity of this ancient but timeless Tragedy. Reg E. Cathey performs the role of Ajax in Doerries’ Theater of War. In his blind and raging anguish, Ajax becomes convinced that he has been betrayed by his fellow captains, stripped of his rightful prize of honor. Leaving his shelter during the night, Ajax sets out to slay the top commanding officers. Wildly slicing, stabbing, and hacking in his deranged and chaotic state, Ajax accomplishes a gory, blood-soaked assassination, not of captains and commanders, but of cattle and sheep held in a pen beside the mess hall. A tidal wave of shame engulfs Ajax when he regains his senses and realizes what he has done. Covered with the blood and gore of sheep and cattle, Ajax knows he will soon be the pitiful laughingstock of the camp when everyone awakens. This is the horrible and tragic moment when Ajax lunges forward and falls down, impaling himself on his discompassionate sword. Since that first performance, Theater of War has continued growing. Year after year, the locations and number of performances are increasing exponentially. Performances have been provided, all free of charge, at the Pentagon, Guantanamo Bay, Army posts throughout Germany, VA Hospitals, Walter Reed Army Medical Center, homeless shelters, high school auditoriums, theaters, and churches. Theater of War performance at Guantanamo Bay. To give an idea of how wildly popular today’s re-enactments of Sophocles’ tragedies have become for Doerries’ Theater of War, in just the first two weeks of May 2017 there are 19 performances scheduled at military camps and bases all over South Korea. Audiences have included service members and veterans from the US Army, Navy, Air Force, Marine Corps, Coast Guard, Special Forces, National Guard, and Reserves, as well as high-ranking officials from the Department of Defense and the Department of Veterans Affairs. Every performance is followed up with an emotionally charged audience discussion facilitated by military community members. Once, when asked why Sophocles, an Athenian general, had written Ajax, a young soldier responded to Doerries, “He wrote it to boost morale.” This was a paradoxical reply, thought Doerries, wondering why the horrific derangement and suicide of a beloved hero could ultimately be a morale booster. Doerries reports, “For me, that was a huge lesson.” While at college, he had believed that Greek tragedy highlights the weakness of the human condition. But the soldier’s perspective focused the significance of tragedy, not in terms of what is happening on the stage, but on the very real change that is experienced by the audience. There will be plenty of time for Doerries to test his new ideas about the cathartic effect of tragedy on the community. Recently named New York City’s newest Public Artist in Residence (PAIR), Doerries will fulfill a two-year residency bringing over 60 Theater of War performances to all 5 boroughs of the city. In her current position as Commissioner of the NYC Department of Veterans’ Services, Retired Brigadier General Loree Sutton is still whole-heartedly supporting the work of Bryan Doerries and his Theater of War Productions. The two-year PAIR project, financed via a generous grant from the Stavros Niarchos Foundation (SNF), is the first city-wide public health program implemented by the Department of Veterans’ Services. Both Homer and Sophocles must certainly be proud of Doerries’ latest commission. In the passage of over 2,500 years, their timeless works are still inspiring humankind, still filling our hearts with their ancient lessons on the horrifying costs of war and the monumental value of peace. 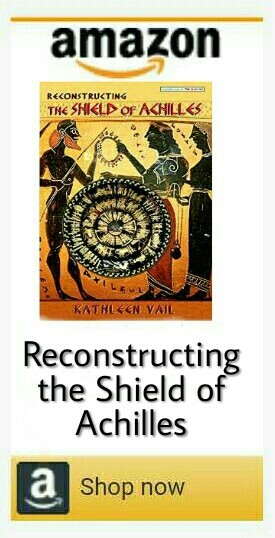 These lessons are epitomized for us within Homer’s Shield of Achilles, the same shield over which Sophocles’ Ajax died in grief for not having attained. To grasp the significance of Achilles’ Shield is to hold the key to human happiness. Unfortunately, humans are very slow learners, but with the help of productions like Doerries’ Theater of War, at least we’re still working on it. Experience your own private emotional catharsis by watching Doerries’ Theater of War in this full-length YouTube broadcast of the first of 60 NYC performances, filmed at The Greene Space on March 20, 2017. An excellent post, Kathleen. Great reading!. The way you portayed Ajax is moving. I think him & Achilles complemented each other somehow…. So his feelings (“spiraling into black depression following the death of Achilles”, as you say are understandable. As to tragedy and catharsis (or Katharsis): great points… Aristotle defined it in “Poetics” as “the purification and purgation of emotions—especially pity and fear—through art or any extreme change in emotion that results in renewal”. He also stated that it can only be achieved if we see something that is both recognisable and distant. I guess theatre is the best way to channel those emotions. The end of tragedy is Catharsis (purgation, cleansing) of the tragic emotions of pity and fear. Aristotle “Poetics”. Section 1. Part VI. http://classics.mit.edu/Aristotle/poetics.1.1.html#200 . Sending love & best wishes! Very beautifully put, Aquileana! Thanks so much for your visit, your finely-tuned perspective, and your eloquent input – sending love & best wishes to you, too, dear friend!